By 2030, it is predicted that nearly five billion (60%) of the world’s population will live in cities. Whilst these spatial shifts are occurring globally, the pace and complexity of urbanisation in the Global South is fundamentally (re)shaping social, economic, political and environmental relationships. Towns and cities are increasingly portrayed as emancipatory spaces that bring ‘prosperity for all’, especially women and girls. Whilst this may be the case for some (due to greater mobility and freedom, earning opportunities and access to services), the reality for many – especially those living in slum settlements – is strikingly different. 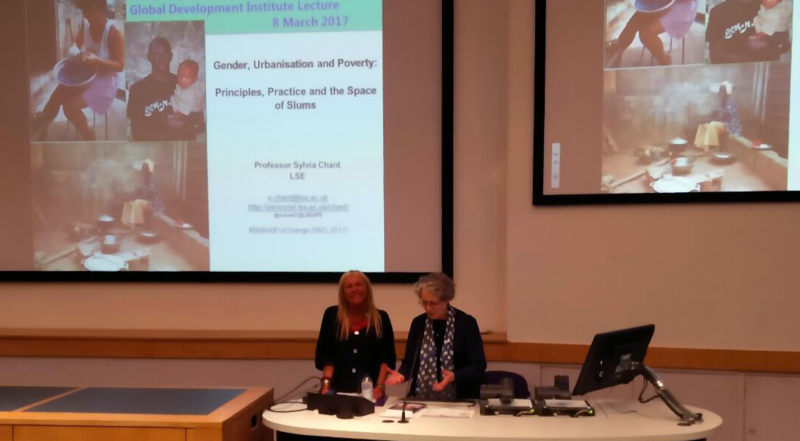 On International Women’s Day (8th March 2017), Prof Sylvia Chant shared why a gendered lens is critically important to understand contemporary urban transformation. She outlined three key trends; 1) that women are increasingly the majority population in towns and cities in the Global South; 2) there is a discrepancy between what urbanisation means in principle, and what happens in practice and 3) slums represent spaces where women and girls face interlocking penalties. Whilst there is regional variation, the overall trend in towns and cities across the Global South is that urban populations are increasingly feminised. This relates to shifting migration patterns (ie legacy of female selective migration and more female migrants), demographic ageing (ie cities of older women) and the rise of female headed households (due to higher levels of female land and property ownership, market opportunities and weakening patriarchal systems). These shifts reflect broader social, economic and politico-legal changes that have enabled (some) women to materialise their aspirations and move with greater freedom. Although the number of women and girls in towns and cities is rising, there is a paradox between women’s contribution to urban prosperity, and the distribution of benefits. Unpaid reproductive and domestic work – fundamental to the operation of cities – is critically undervalued in this context. Prof Chant read out a striking quote from Manuel Castells (1978) to demonstrate this point; ‘if women who ‘do nothing’ ever stopped to do ‘only that’, the whole urban structure as we know it would become completely incapable of maintaining its functions’. Slums are important spaces in which to challenge assumptions about greater gender equality in cities. Women and girls living in informal, low-income, slum, shack, favela, shanty or bustee settlements face multiple, interlocking penalties. These penalties relate to; time (eg undervalued reproductive labour and daily work, limited access to infrastructure and services), economic (eg restrictions to income-generating activities due to lack of space, transport and child-care needs) and health and wellbeing (eg lack of time for rest and relaxation, greater exposure to urban violence, domestic abuse, mental illness and infectious disease). In my own research in Dhaka’s slum settlements, Bangladesh, I have seen how these penalties play out in practice. Women and girls are expected to carry out all household chores (cleaning, cooking, water collection) and childcare duties, even if they spend 12 hours a day working at a garments factory. Many are forbidden or unable to leave the settlement to work and those that do (especially young girls) are teased and harassed on the street. Many also shared their stories of domestic violence and frustration at feeling trapped in abusive relationships where they cannot seek justice, without fear of repercussions or extortion. Whilst these penalties are particularly severe for those living in slum settlements, they are not constrained to the Global South. Right here in Manchester, women and girls face daily inequality and discrimination, from fear of being harassed on the street (#ReclaimTheNight), to seeking equal pay and employment opportunities. During my time as a volunteer at Manchester Action on Street Health (MASH), I’ve seen how vulnerable women face an upward battle for security in a harsh and increasingly unequal city; struggles that transcend Global North/South boundaries. Despite these stark inequalities, there are opportunities for, and examples of, progressive change across the world. From women and young girls fighting – both individually and collectively – for education, healthcare, livelihoods and mobility in Dhaka’s slums, to the solidarity between men and women within the Slum/Shack Dwellers International (SDI) network; global marches against gender-based violence, as seen with ‘Not One Less’ (#NiUnaMenos), and gender equality and Girl Power mainstreamed into the UN Global Goals (#WhatIReallyReallyWant). Ask yourself, what can YOU do to transform towns and cities into safe and emancipatory spaces for women and girls? Whether on your doorstep or further afield, we all have a part to play, so #BeBoldForChange.